This is a fun classroom project for teaching geography to elementary school children. Each child is issued their own U.S. passport. 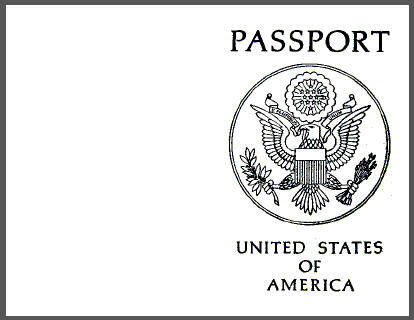 You need to print only one double-sided sheet to include the "official" U.S. passport cover and the inside personal information page (should be directly "under" the cover printing. Our information page has the requisite information of DOB (date of birth) and POB (place of birth), as well as school, teacher, and grade (especially useful if several classes do a combined activity). Once the cover page is printed, you simply need to fold it in half to create a passport book. Staple in as many blank pages as you think you'll need (one page, which amounts to 1/4 of a sheet of paper, per country). The easiest way to use this passport is to "stamp" it for each country visited (that is, each country students have studied). Having a passport keepsake makes learning about foreign lands even more fun for kids. Teachers can require knowing basic knowledge about the country as necessary for earning the stamp (e.g., name the capital city, pinpoint the country on a globe or world map, name the language(s) spoken in the country, and name two major exports). For our restaurant passport supplement, click here. Hello! Working at an enrichment center, I helped organize and execute international experiences for young kids. We had one class at a time visit our facility, and over just a few hours, students were treated to a "world tour" of three countries, as well as to "international cuisine." Unfortunately, due to budget cuts, this learning center was closed. Luckily, though, it isn't very difficult for teachers to use this fun activity in their own buildings. Having done this with over a hundred classes, I can guarantee that KIDS LOVE IT. We first issued each student a realistic-looking passport, which the kids filled out. Photos can be attached to the inside cover, but self-portraits work just as well. We also gave each student foreign spending money. 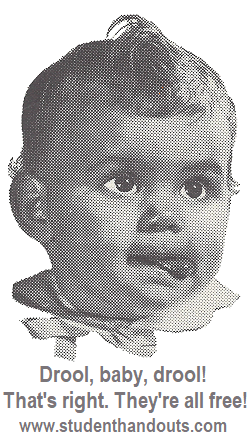 Ours was made from card stock Euro images obtained for free from the European Union that we laminated for durability. (Since kids later spent their money, we always got most of it back.) Students were then conducted to our "aircraft." We used an empty classroom (any large space, gymnasium, or auditorium will work) and arranged chairs in rows to look like the inside of an airplane. Our principal joined in on the fun, donning a pilot's hat. Children played along as our "pilot" told them to fasten their imaginary seatbelts, prepare for takeoff, etc. While "flying," he told them a little bit about the country they'd be visiting. Soon enough, the plane landed, and children got to explore a country. Typical countries included China, Mexico, France, Kenya, Poland, and Japan. It varied depending on what activities we had for the particular age group. For example, we could do a traditional Japanese tea ceremony with older kids (grades 5 and 6), but not with first graders. With first graders, we could visit France, singing and dancing in a circle to "Sur le Pont d'Avignon." Before leaving each country, students would visit the gift shop to buy souvenirs and get their passports stamped. We made the souvenirs ourselves--mostly postcards (which kids would fill out and give to their parents), bookmarks, and the like (items we could make at low cost). The last country of the three-country trip was always where we ate lunch. Burritos for Mexico, crepes for France, rice and spring rolls for China, etc., were typical of our international cuisine. Hopefully the above description gives you a good idea of how we implemented these international travel programs with kids. But of course, use your imagination and local resources! A lot of cultural organizations would love to have a representative participate. You may find a "real" French person to speak French to your students and sing a French song with them. Perhaps there's a Polish group in your town that would love to do the polka with your sixth graders, and feed them sauerkraut and kielbasa. We highly recommend using food to help with the sensory experience, but keep in mind that kids can be very picky eaters! It's easy to convince kids that a crepe is a French pancake, but if you can get a first grader to try escargot, we want to hear your story! Older kids will try sauerkraut, but again, not most first graders. Be aware that local eateries will typically offer a discount once they understand the nature of the program. Souvenirs are easy to make using card stock. A sheet of paper can make four postcards. Usually, we'd simply use Google to find pictures from a country, being sure to have the name of the place or monument listed on the card. The image of the Arc de Triomphe in Paris is typical of the postcards we made (although we'd try to find drawings and black-and-white images to save on ink). If you have money for "real" souvenirs in your budget, companies like Oriental Trading offer inexpensive Chinese yo-yos, finger traps, and more, which kids love. Travel posters are also fun for teaching history and culture. (We got ours free from travel agencies; they're constantly getting new posters and throwing away the old ones.) These posters showed important monuments, regions, etc. We hung them up, and our "tour guide" would stop at each one to describe its historical and cultural importance. For example, a poster of the Eiffel Tower would be accompanied by a brief description of its height relative to other Paris structures, how it represents the steel beam construction that came into being during the Industrial Revolution, how the citizens of Paris initially hated it, etc. Another idea that might be fun would be to have the older students in the building create and implement learning experiences for the younger kids. Sixth graders could reinforce their existing geography knowledge while acquiring even more. And with the older kids "running the show," parent volunteers wouldn't be needed to work the souvenir booth, serve food, and the rest. 1. Plane ride to country #1. 2. Guided tour of country #1. 3. Activity in country #1. 4. Souvenir shopping and passport stamping in country #1. 5. Repeat for countries #2 and #3. 6. Lunch in country #3. Encouraging parental involvement can also lead to learning about countries you might not otherwise cover, and will do a lot to make recent immigrants (and the children of immigrants) part of the learning experience. When telling parents about these "field trips," mention that you are open to suggestions and help with picking countries to visit, learning about the culture, serving food, and whatever else parents might offer. You might get lucky enough to have, for example, a Filipino parent bring in pancit and teach stick dancing. You never know! FYI: The hardest part of this project is putting it together--printing and assembling the passports and souvenirs, acquiring postcards, learning national songs and dances, etc. But once you get the basics down and host your first field trip, you'll absolutely love it, and so will your students. Before you know it, you'll have a box for each of many countries, full of activities and printables for when the students "visit."